The Cathedral opens one hour longer in March, April, October and December, two hours longer in May, July and September and three hours longer in August. 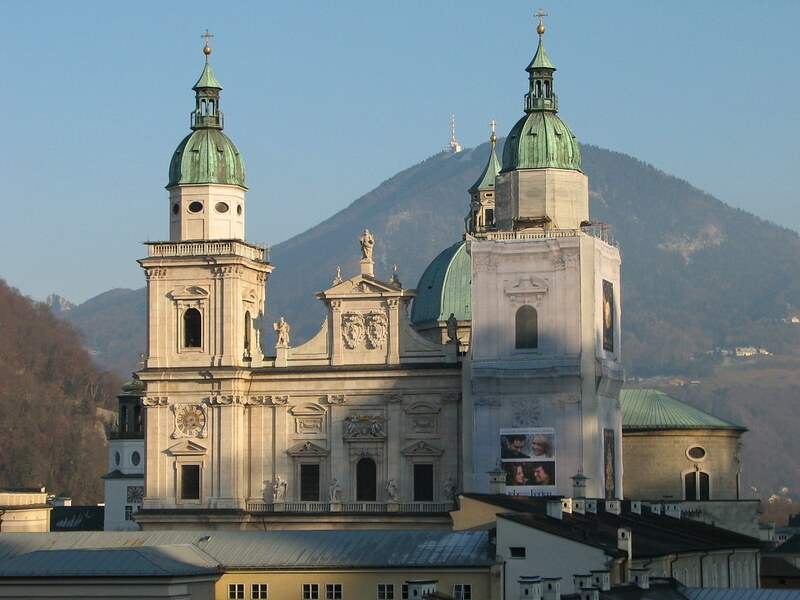 The Salzburg Cathedral or Salzburg Dom is a baroque Cathedral built in the 1600's. Although the Cathedral itself is relatively new, the site it stands on is much older. There are records of the site being used as a Christian place of worship going back to 774. Prince-Archbishop Wolf Dietrich is responsible for the Cathedral as it is today. Dietrich is also responsible for the Residenz, which stands opposite the Cathedral. Although the previous buildings on this site are long gone, there are still remnants of the past here. In the crypt there are relics from the old Roman cathedral that existed here hundreds of years before the current church. To the left of the Cathedral entrance are the excavations. In this section, it is possible to see the original foundations from the 8th century. 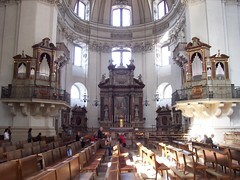 This is the church in which Mozart was baptized. The medieval fountain that was used to do this still exists, and is found near the entrance to the Dom. 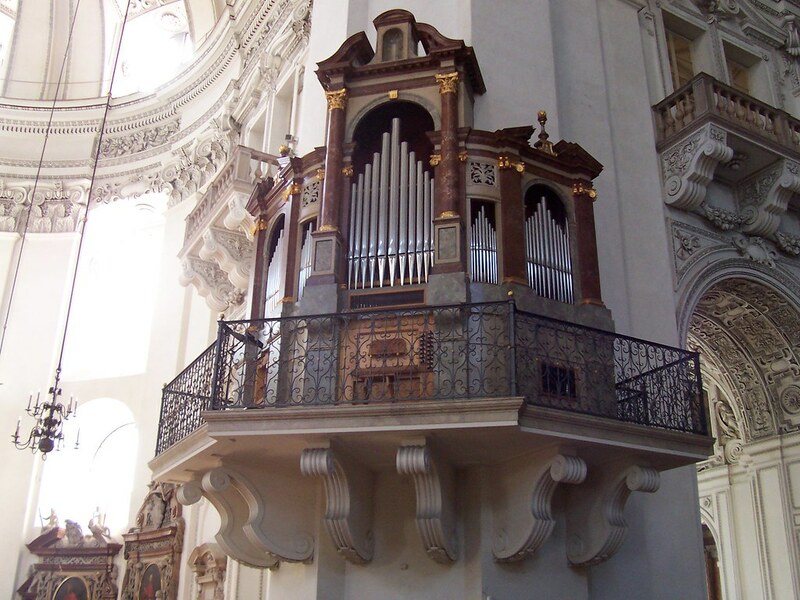 Also worth noticing is the 4000-pipe pipe organ surrounded by angels playing instruments and the elaborate frescoes that adorn the walls and ceiling of the Cathedral. In November and December this is the site for the famous Salzburg Christmas markets which draws visitors from all over the world. Entrance to the Salzburg Dom is free but there is a cost for the Dom Museum. This is however included in the Salzburg Card. It is recommended that visitors purchase this card as it is cheaper than the single entry cost to even the three most popular Salzburg Attractions (Salzburg Fortress, Residenz and Salzburger Dom). 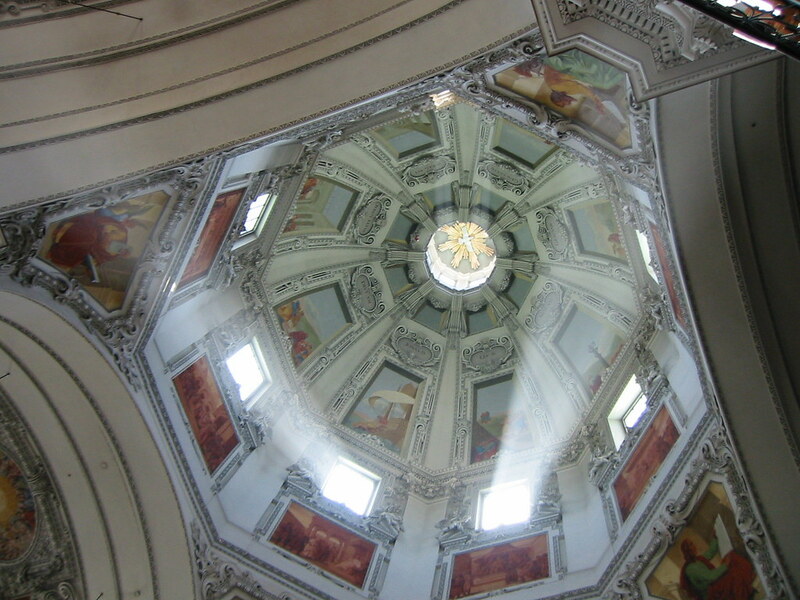 The Cathedrals in America simply have nothing on the Cathedrals of Salzburg. We visited two churches in Salzburg, this one and St Peters Abbey, and it's hard to decide which was the best. The pipe organ in the Salzburg Dom was the most impressive feature here we think. Have you already visited the Salzburg Cathedral (Dom)? If so, let everyone know what you thought about it by writing a review! No registration necessary. Just click here to start writing! 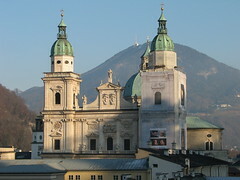 View all Salzburg Cathedral (Dom) Pictures.